I grew up in Villanova, PA and have lived in Vienna AUS, Prague CZ, Manchester UK, Phoenix AZ and have spent the last 10 years in Southern NH. I swam competitively until I was 12 and then focused on field hockey, lacrosse, skiing, and other sports but it was the swimming that led me to be the “swimmer” for a triathlon relay team in the Bud Light Series, back in the 1980s… I completed my first Sprint at the age of 12! I spent the next 12 years focusing on lacrosse, culminating my playing time as a 4-year Division I starter and beginning my coaching career as the Head Coach of the Czech National Women’s Lacrosse Team for the 1993 World Cup. Coaching became my passion from that point forward. My adult triathlon career started in 2006 after my 2nd daughter was born and I needed to cross train! 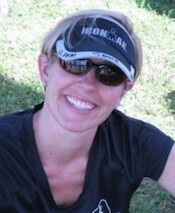 After 11 Half Ironman races, several short course races, and 4 marathons, I was forced to take a 2-year hiatus from all training to recover from a car accident and subsequent brain surgery in 2011. In 2013, refusing to end my career without having accomplished my dream of doing an Ironman, I came back and completed Ironman Mont Tremblant. In 11 hours and 52 minutes, my dream came true, landing 17th in my age group. Mission accomplished. Over the last 8 years I have been helping triathletes get faster by dialing in their overall and race day nutrition. In February of 2013, I committed to taking that coaching to the next level and began my certification for USAT Level I Coach and in May I will complete my Road Runners Club of America Coaching Certification as well. Currently coaching athletes from PA to NH, I look forward to combining my efforts and business with Peak Triathlon to deliver personalized 1v1 Triathlon and Nutrition Coaching to our athletes. Read Coach Leslie’s client testimonials.